Also serving communities of Marlow. There are 4 Assisted Living Facilities in the Duncan area, with 3 in Duncan and 1 nearby. To help you with your search, browse the 6 reviews below for assisted living facilities in Duncan. On average, consumers rate assisted living in Duncan 4.6 out of 5 stars. Caring.com has helped thousands of families find high-quality senior care. To speak with one of our Family Advisors about assisted living options and costs in Duncan, call (855) 863-8283. Each year, bargain hunters flock to Duncan for the World's Largest Garage Sale. When cooler weather arrives, Duncan residents satisfy their cravings at the Annual Chili Cook-Off, bring furry friends to Bark in the Park and pay respect to former military members at the Veteran’s Day Parade. Seniors — who make up 17.9 percent of the population in Duncan — can experience these events and more. There are four assisted living facilities in the Duncan area, three of which sit within city limits. The Oklahoma Department of Health's Health Facility Systems ensures these communities care for aging residents in safe, nondiscriminatory environments. Duncan has clear summers and cloudy winters, with plenty of rain in early June. Temperatures generally fall between 18 degrees Fahrenheit and 103 degrees Fahrenheit during the year. Seniors may want to keep a jacket on hand year-round in case of unexpected rain or rapidly dropping temperatures from day to night. Long drives aren't the norm in Duncan; on average, residents spend 18 minutes commuting to their desired destinations. Seniors without vehicles can use Red River Transportation for rides to appointments or events. All vehicles are wheelchair accessible. Duncan is safer than 8 percent of U.S. cities, including Oklahoma cities such as Shawnee and Ardmore. Seniors may want to consider alarm services to help thwart property crimes. Residents of Duncan have a one in 24 chance of experiencing a property crime. Duncan has a higher air quality score than the national average, making it suitable for seniors without serious respiratory conditions. The city has a score of 62 compared to the U.S. average of 58. Scores are based on a 100-point scale that includes results from the National Air Toxics Assessment. The Duncan area is home to world-class medical facilities, including Duncan Regional Hospital, in the event of medical emergencies or illness. Oklahoma has a lower cost of living than the U.S. average, and Duncan residents enjoy lower expenses than many parts of Oklahoma. Duncan has a cost of living score of 78.5 on a 100-point scale, while Oklahoma sits at 84. Affordable utilities, groceries and transportation are a few perks Duncan offers. Assisted Living costs in Duncan start around $2,400 per month on average, while the nationwide average cost of assisted living is $4,000 per month, according to the latest figures from Genworth’s Cost of Care Survey. It’s important to note that assisted living rates in Duncan and the surrounding suburbs can vary widely based on factors such as location, the level of care needed, apartment size and the types of amenities offered at each community. Two programs, the ADvantage waiver program, and the State Plan Personal Care program, help Duncan seniors with limited resources receive essential care from assisted living facilities. Elderly Medicaid recipients with a verified need for services may qualify for assistance with residence fees, medication costs and personal care expenses at approved communities. Learn more about these programs, plus who’s eligible, on our Assisted Living in Oklahoma page. For more information about different ways to finance assisted living, visit our Assisted Living in Oklahoma page. Duncan and the surrounding area are home to numerous government agencies and non-profit organizations offering help for seniors searching for or currently residing in an assisted living community. These organizations can also provide assistance in a number of other eldercare services such as geriatric care management, elder law advice, estate planning, finding home care and health and wellness programs. To see a list of free assisted living resources in Duncan, please visit our Assisted Living in Oklahoma page. 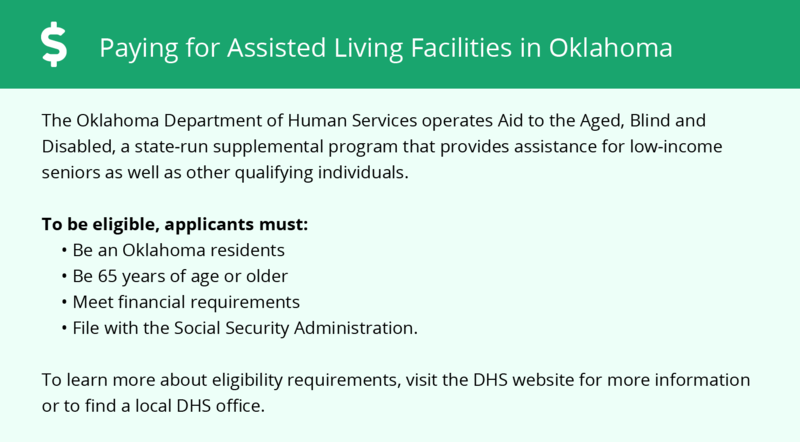 Duncan-area assisted living communities must adhere to the comprehensive set of state laws and regulations that all assisted living communities in Oklahoma are required to follow. 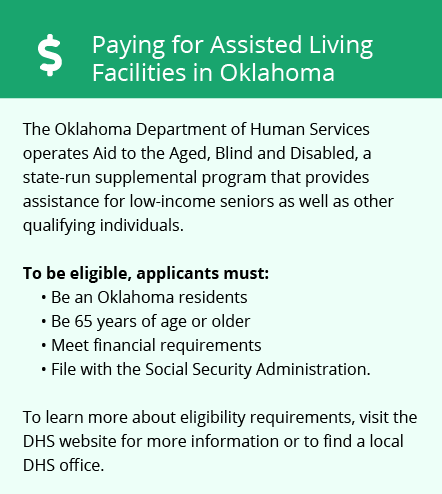 Visit our Assisted Living in Oklahoma page for more information about these laws.